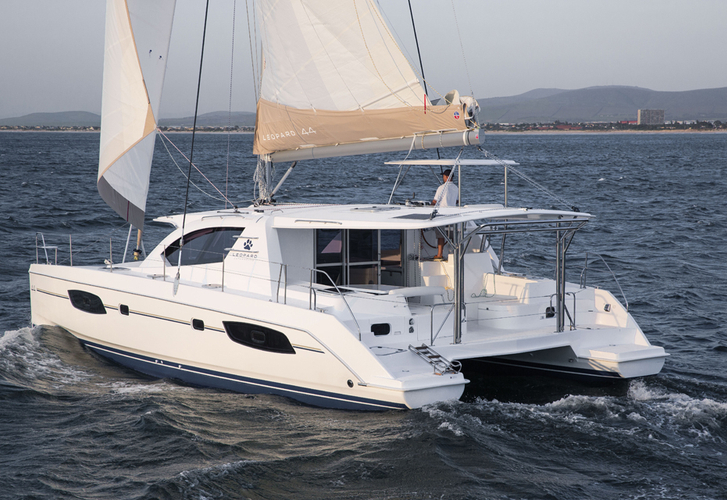 La Pelosa is a name of sailing boat Leopard 44 ,which has been manufactured in 2013. You can charter this vessel from base Victoria in region Mahe. La Pelosa is furnished with 8 berths. Berths on the sailing boat are arranged in 8 layout. 4 bedrooms are placed inside the yacht La Pelosa. You can see more vessels here: Catamarans Mahe. Crew members can feel good on this boat , because there are 4 WC for their disposal. With 700.00 l l. in diesel tank you can sail really far and still be independent because of 780.00 l l. in water tank. La Pelosa is driven by motor 2x 39 hp Yanmar Diesel. Boat's dimensions are: lenght - 12.98 meters , beam - 7.25 m and 1.30 meters of draft. On the boat you will find following equipment: Air conditioning, Dinghy, Mainsail with lazy jack. . Security caution is 4000.00 EUR. In our search engine you can effortlessly check avalailability of yacht La Pelosa from Victoria by clicking on this link: Catamarans Seychelles.